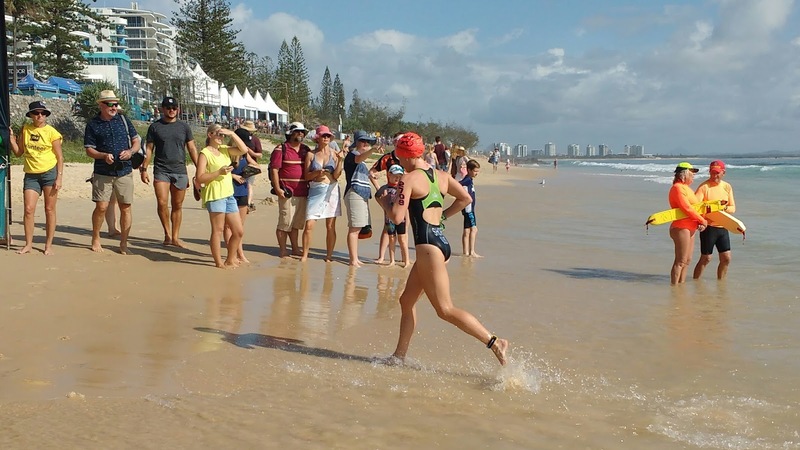 The Mooloolaba triathlon festival was a whole different racing experience to what I’ve been used to. Moving from a field of approximately three 20 – 24 female triathletes in South Australian races to a field of 30+ amongst a race with 3500 entrants was a bit of an exciting transition! In the lead up to this race I had a solid training block over the university break, however the transition back into a university timetable put some strain on the training program. Over the weeks leading into the race we had to do the best we could while managing increased fatigue levels. So I had doubts about how well I was prepared for this race. However in the taper week leading into the race I began to sharpen up, like Steve said I would, and I became excited for the race. Race day was a whole new experience – without having the 3 qualifying times I needed to race in the Open division this year I was required to race in the 20 – 24 AG, which was a strong field in any case. But, this meant that I started 2 hours after the Open category athletes. It was a bit strange sitting in the apartment still eating breakfast while the first athletes came through transition that’s for sure! Lining up on the swim start at 8.30am, after completing our usual warm up, I was really excited to start the race, and with a water temp of 26 degrees and the day already heating up to a scorcher - it was almost a relief getting into the water on the wave start! The swim started off quite rough with everyone fighting for a good position leading into the first buoy, and I was relieved to catch the feet of a faster swimmer, managing to reach the lead of the pack and settling in next to a swimmer of about the same speed. My coach and I had put an enormous amount of work into my swimming speed over the off-season, so I was stoked to be able to hold a faster swimmer’s feet for the full 1500m swim and leave the water with a near top 20 swim time of the day. After a long run into transition it was out onto the bikes, and once over the first couple of inclines I settled into TT along the freeway heading out of Mooloolaba. 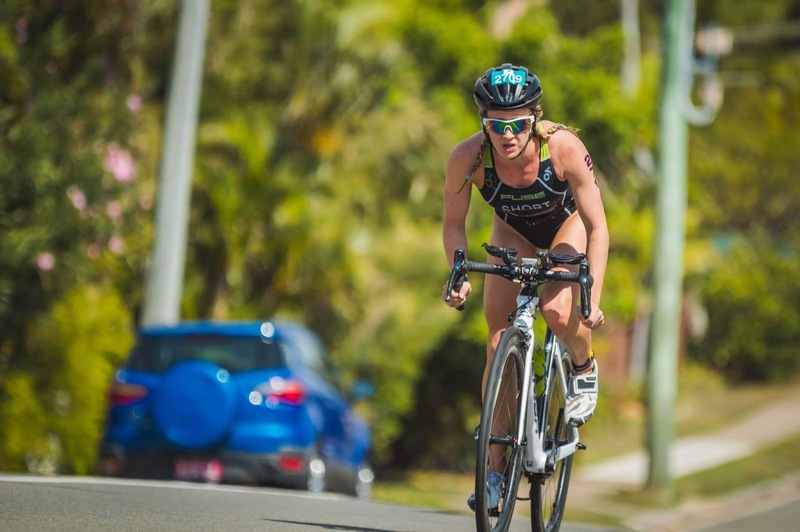 For this race I used my Merida Reacto with clip-on TT bars – which worked well, especially on the more technical parts of the course heading out from Mooloolaba. On the long straight sections, there was little need to change gear, so I was able to get into a good rhythm and low on the TT bars. By the time I had hit the bike course, the day was starting to heat up with the temperature and humidity making itself felt along the out and back bike course. Starting as one of the last waves of the race, keeping an awareness of speed and effort level was more difficult than usual without the faster riders providing a pace to reference off of. However the 40km ride finished relatively quickly without any major incidents and I was pretty happy with the average speed I was able to hold. Coming off the bike and into transition I knew I was placed about fourth in my age group and was feeling good about heading into the run. 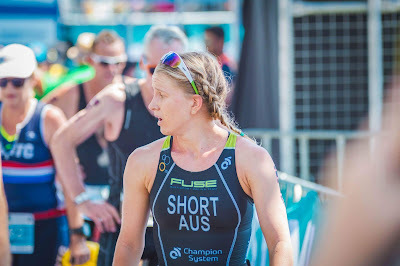 The run is always my strongest leg and with the pace based run sets my coach has had me rehearsing at our squad run sets over the last 12-weeks we were confident that I was capable of running about a 39min 10km off the bike. This is what I was expecting to do. Unfortunately, within a couple hundred meters of the run start I knew that this wasn’t going to happen today. Heading out onto the run course at about 10am, the sun was well and truly blazing – and after a cold summer in Adelaide the heat affected me more than I thought it would despite completing a lot of heat based sets at home. After heading over the first hill I found that instead of asking myself how much harder I could possibly push the pace (like I usually do in races), I was telling myself just not to stop running. An asphalt road, reflecting all the heat back up, didn’t help matters. Looking around though I could see everyone was suffering. Stopping at every aide station for water seemed to make a difference and cooled me down enough that I was able to hold a reasonable pace. 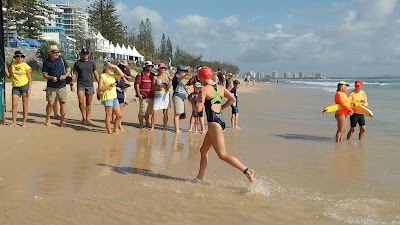 Nearing the last 1km of the run course I caught sight of 2 other triathletes I knew were in my age group – and the motivation to catch them was enough to push the pace up just a little more and make up 2 positions to cross the line in 3rd in my age group and 18th female overall. After that it was straight into the ocean which was a convenient 20 meters from the finish. Overall it wasn’t quite the result we had planned for – and definitely not the run performance I was expecting. But, it was the best I could do on that day. A lot of positives came out of the experience; I completed my fastest open water swim by a mile, I gained some race experience in the largest race I’ve ever competed in and I learnt something about the impact of heat on performance. Most importantly I’ve learnt that sometimes, despite solid preparation, conditions are not always going to be within the range you’ve trained in, so you just have to do what you can on the day and be happy with the outcome when you know you’ve delivered your best possible effort, at that time, on that day. Thanks to my coach Steve O’Brien who travelled with me to the race and has put up with me on a near twice daily basis. Over the last year or so, Steve has run up to 13 sessions a week with me, and up to three of those sessions each week have been 1-1 sessions in the pool working on my swimming technique with video analysis and stroke/rate counting. The progress in my swim performance over this time has been good, but there’s still a long way to go. 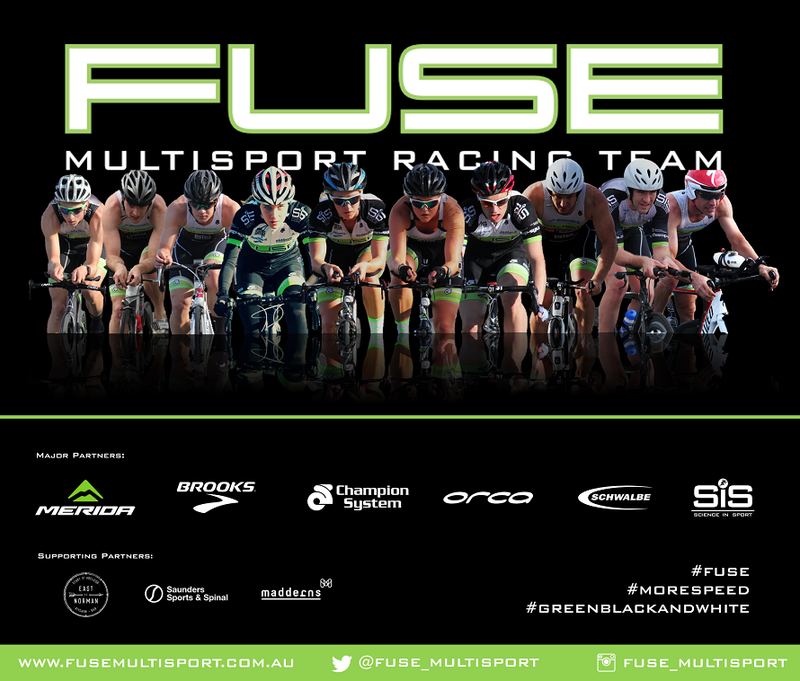 Thanks also to my team mates at Fuse Multisport and to Steve’s family – Karen, Emma and Ben. I have two races left to finish the season, including the Luke Harrop Memorial event in the Gold Coast. After that, it’ll be back to the pool to invest in some more swim work for draft legal events next season. A massive thank you as always to the squad’s major partners Merida Australia, Brooks Running Australia, Champion System Australia, Orca Australia, Schwalbe Australia, Science in Sport and also to East of Norman, Madderns Patent and Trade Mark Attorneys and Saunders Sport and Spinal who support our training and racing.